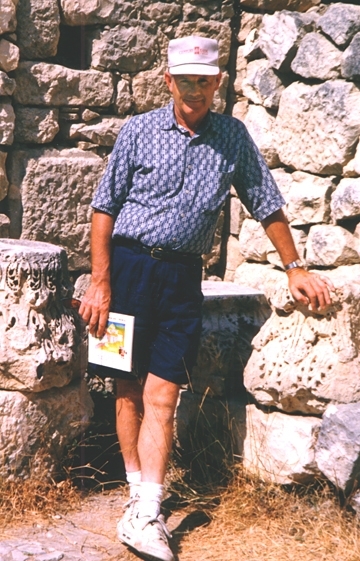 Ancient Coins for Education - Wayne Sayles, Myra, Turkey - ACE Supporters at Ancient Sites. Home Special Projects Coin, Collector, Location Wayne Sayles, Myra, Turkey - ACE Supporters at Ancient Sites. Wayne Sayles, Myra, Turkey - ACE Supporters at Ancient Sites. "Saint Nicholas, the generally recognized inspiration for Santa Clause, was a real historical figure. During the fourth century, he served as Bishop of the Christian community in southern Anatolia that was called Myra. When he died, a church was built at Myra to house his remains. It has been rebuilt many times, but the basic church still survives in this small Turkish city (a long way from the North Pole). In the Middle Ages, Latin traders from Bari, Italy sacked the church and stole the bones of St. Nicholas, leaving only a few odd pieces in their haste. They spirited the bones off to Italy, where they remain today in a church built for the purpose. I always found this place interesting because of the unique story of St. Nicholas and the bizarre tale of his posthumous abduction."